Smilla is a husky, a sled dog from Norway who ran in the lead position in the Iditarod in Alaska. After running in the Iditarod in the Spring of 2012, Smilla’s team stopped in Washington on the way home to Norway. Smilla and another dog shared a crate on the drive from SeaTac Airport to a friend’s house in Fall City, where they planned to stay a few days. At Fall City, the two dogs had a disagreement, and the crate burst open. Smilla escaped on March 10th, 2012, but I didn’t learn of her until she’d been on the run about a month. Smilla’s owner had returned to Norway without her, and her friend in Fall City was doing what he could to find her. Smilla liked to run, of course, and she was sighted all around Fall City, and from Preston to Snoqualmie. Animal Control set a trap for her, which she liked to lay beside. When I learned about Smilla, I spent hours traveling to places she had been seen, always arriving too late. Finally, I got a call that she was snoozing on the grass near a church in Issaquah, and I arrived in time to see her. I approached her with a net on a pole, looking rather like a cartoon dogcatcher. I got within ten feet of her before she alerted and ran off. The next week, I brought Komu to a field outside Fall City where Smilla was hanging around. I could see her lying in the tall grass. I tried to use Komu as a magnet dog, since Smilla liked other dogs. That was nearly a disaster. I let Komu loose in the field. He tried to engage her in play. She seemed like she might like that, but then she bolted. Komu ran after her. Both dogs were running toward me, and a busy highway was behind me. I had to stop my dog from running into the road, and I heard the screeching tires and horns honking as Smilla dashed onto the highway. I put Komu in the car, and we found that Smilla had entered a new neighborhood a mile down the street, unharmed. 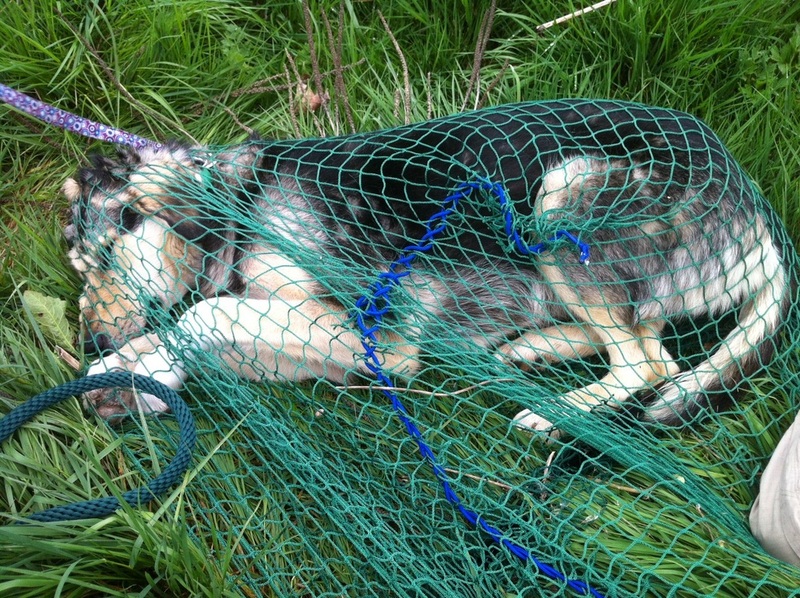 When Smilla ran twenty miles away to Lake Kathleen in east Renton, we set a humane trap for her. People were able to feed her and get fairly close. Then Smilla moved to the cemetery on the hill in Renton, where Jimi Hendrix is buried. I saw Smilla sleeping on the grass in the cemetery, and I was able to sneak up on her with a “Snappy Snare” which is spring loaded to pop over a dog’s head and tighten up. The distant roar of the freeway masked any sound, and the manicured lawn of the cemetery helped me stay silent. I tried to use the wind direction to keep Smilla from catching my scent. (If I had had the big net in my hands at that point, I would have caught her then.) I was able to get within reach of putting the Snappy Snare on Smilla, but her head was down, so I had no target to slip the snare over. I was three feet away from her and unable to catch her. She woke up, her head popped up, and then she ran off before I could react. Smilla was seen around Renton a few days, and then she ran twenty-two miles back to Fall City, to the golf course on the river, near the place she started. I brought a sedative prescribed for my dog, and Miriam, a volunteer who had been helping me, brought liverwurst that she’d brought home from Germany, which was especially fragrant, to hide the drugs in. I stayed away, since Smilla would probably associate me with previous capture attempts. Miriam was able to get within ten feet of Smilla and feed her the drugged liverwurst. Smilla got sleepy, even with the golf balls whizzing past her head. I was able to sneak up on her again with the big net, as Miriam sat on the grass and talked softly to her, but she woke up again before I got within striking distance. Another volunteer, Scott, tried sneaking up on her with the net when she settled in a new spot, in case Smilla recognized my smell specifically, but Scott was unable to get close enough to catch her. We gave Smilla a little more sedative in the liverwurst, and followed her around seven holes of the golf course for the next four hours. She would stumble away drunkenly ever time we tried to catch her. Golfers were chuckling about three people with a cartoonish net chasing after a drunken dog. Finally, in desperation, I decided not to just sneak up to within striking distance. Instead, I would sneak within ten feet, sprint the last distance and throw the net on her. My heart was pounding as I prepared to dash toward her in the tall grass between fairways. I felt that if this attempt failed, we might never catch her. I stayed down wind so she wouldn’t smell me too soon. I set my feet carefully to avoid twigs that might snap. About ten feet away, I took a deep breath and lunged forward. Smilla alerted to me, but in her drugged state, she couldn’t get up as quickly as she normally would. I was able to throw the net on her. I caught her, finally, seven weeks after her escape. Now I had her in a net, and I put my hands on her to stop her from struggling. Miriam and Scott brought a large kennel. We scooped her in with the net still on, closed the door, and then cut the net away. We weren’t going to risk losing her again. We took her to the vet, and she was in surprisingly good health. She hadn’t lost much weight because people were feeding her everywhere she went. Smilla had traveled at least fifty miles before ending up just a mile away from the point of escape. She needed medication for a bug she had picked up, but she was fine. 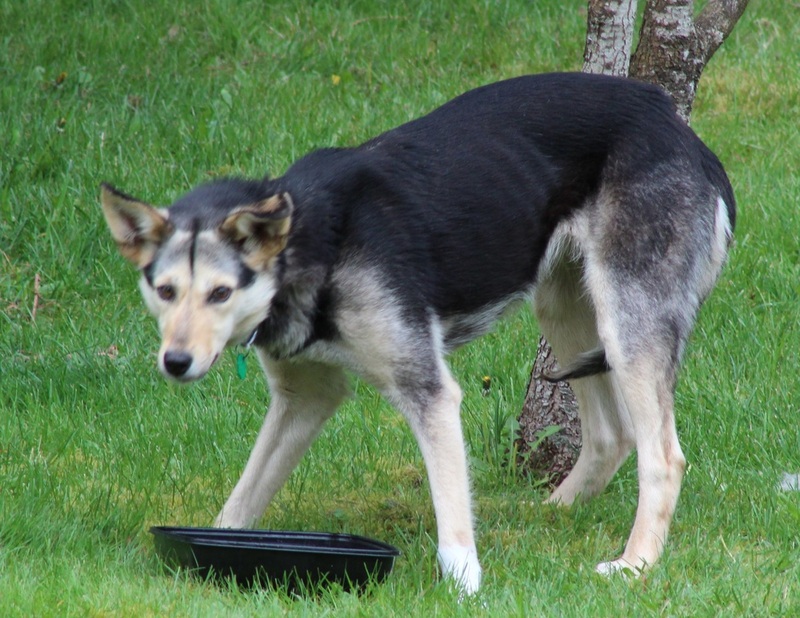 Smilla’s owner in Norway chose not to come back for her, so Smilla was adopted by a family that had other sled dogs. Smilla is not the kind of dog you could pet much, if at all, but she does like hanging around with the other dogs and being hooked up to the sled once in a while. I visited her on the farm, months later, and she wouldn’t come near me. I admired her from afar.